2 | Pag e Develop m Develop m resource t and vide o which we Main For m e m ent Contin u m ent continu e t ypes, such a o has not yet b operate, th e m Screen Pri n es e s on the ap p s newspaper s b een implem e evolution o f n ts p lication with s will be add ented. As wi t this project c This is the launched. T database. T from the li s Here we c h 'Gainesvill e items in th A single re s changes likel ed with their t h all large p r c ontinues. main form w T his screen i n T his form ca n s t. h ose to searc h e in the title. e MAP proje c s ource can b e l y to be seen own unique r ojects in the hich is seen w n itially shows n also be use d h for all reso u Additionally c t (and all pr o e located by s to the datab a properties. A changing en v w hen the ap p all the UF re s d to search f o u rces with th search resul o jects under M s earching for a se as well. N A dditionally, a v ironment in p lication is sources in th e o r single item s e word l ts are limite d M AP). the bib id di r N ew a udio e s d to r ectly. 8 | Pag e Archive M e M edia Screen Prints We select e project. The Archi v and DVDs i displayed. We have n project th a e d the 'MHC' v es form lets u i n the local a r ow searched a t reside in th collection an u s view infor m r chive. Here, for all archi v h e range bet w d now can vi e m ation abou t all items in t h v ed CDs and D w een CD num e w all items i t each of the h e archive ar e D VDs in the J U ber 500 and 7 n this CDs e U V 7 25. 9 | Pag e e Selecting a informatio single row f r n for a single r om the Arch resource on ives form dis p the selected play the CD. 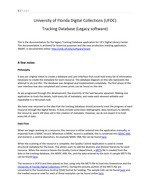 DRAFT 5/24/05 DLC Tracking Database Â– DTdb Phase 2 requirements 1. Integrate DTdb with QC tool Â– Modify QC tool and DTdb to support expanded DTdb data structure. Allow user to specify Volume, Page and Page Type (Division) information. Allow QC tool to run independently from FileSort tool. 2. Integrate with FileSort tool Â– Modify FileSort tool and DTdb to support expanded DTdb data structure. Allow wider range of file types (TIFF, GIF, JPG, JP2, others in future) Allow range of file types to be expanded easily. Allow storage of multiple types of checksum information. FileSort tool will be capable of adding file information to DTdb and may be run independently from QC tool. 3. Modify print parameters so that printing from search results page prints in Landscape mode. This will allow maximum space for expanding fields and allow maximum amount of data to be displayed. 4. Modify display to include Volume Identifiers for single volume items. (SPR-179) (point 45, SPR151). 5. Modify multi-volume sort so that volumes are sorted by volume first then issue. Modify sorting of volume and issue columns so that they are sorted as if right-justified. Add a Volume ( autofill: Example for Serial: Monthly ) Type: Monograph Newspaper Serial Annual Monthly Weekly J F M A M J J A S O N D First: Year Month/Season Volume Issue Day 2005 January 100 1 Last: Year Month/Season Volume Issue Day 2005 December 100 12 When the radio button Â“MonthlyÂ” is clicked, display Month check boxes and allow any number of Months to be checked; this establishes the publication pattern. Add a Volume ( autofill: Example for Serial: Weekly ) Type: Monograph Newspaper Serial Annual Monthly Weekly First: Year Month/Season Volume Issue Day 2005 January 100 1 1 Last: Year Month/Season Volume Issue Day 2005 December 100 12 15 In this example, you will have to be calendar-aware. When the radio button Â“WeeklyÂ” is click ed, presume publication every 7 days. Add a Volume ( autofill: Example for Monograph with just volumes ) Type: Monograph Newspaper Serial First: Year Month/Season Volume Issue Day 1 Last: Year Month/Season Volume Issue Day 2 In this example, we understand Â“IssueÂ” to be a second or der hierarchy and Â“DayÂ” to be a third order hierarchy. Data entered into Volumes, Issues or Day may be alphanumeric. Monographs may also use Year and Month/Season Â– allow, BUT do not autofill this information. Add a Volume ( autofill: Example for Monograph with just volumes and sections ) Type: Monograph Newspaper Serial First: Year Month/Season Volume Issue Day 1 1 Last: Year Month/Season Volume Issue Day 2 5 In this example, we understand Â“IssueÂ” to be a second or der hierarchy and Â“DayÂ” to be a third order hierarchy. Data entered into Volumes, Issues or Day may be alphanumeric. Monographs may also use Year and Month/Season Â– allow, BUT do not autofill this information. Add a Volume ( autofill: Example for Monograph with just volumes, parts and subparts ) Type: Monograph Newspaper Serial First: Year Month/Season Volume Issue Day 1 1 A Last: Year Month/Season Volume Issue Day 2 5 F In this example, we understand Â“IssueÂ” to be a second or der hierarchy and Â“DayÂ” to be a third order hierarchy. Data entered into Volumes, Issues or Day may be alphanumeric. Monographs may also use Year and Month/Season Â– allow, BUT do not autofill this information. Subcollections: [ for each column count Subcollections ] DIGITIZATION IR ALL Bibliographic Items Scanned: [ for each column count BibIDs YTD ] Volumes Scanned: [ for each column count VIDs YTD ] Images Created: [ for each column count TIFFs YTD ] Text Generated: [ for each column count characters (may include mark-up) YTD ] UFDC DEPLOYMENT IR ALL Bibliographic Items Deployed: [ for each column count BibIDs YTD ] Volumes Deployed: [ for each column count VIDs YTD ] Images Deployed: [ for each column count JPEGs/JPEG2000s YTD ] Text Deployed: [ for each column count characters (may include mark-up) YTD ] UFDC SHAPSHOT IR ALL Archives (b=Items) (v=Volumes) (i=Images) [ for each column count archi ves BibID (VID) numbers YTD ] b: b: v: v: i: i: Audio (b=Items) (v=Volumes) (i=Images) [ for each column count audio BibID (VID) numbers YTD ] b: b: v: v: i: i: Books (b=Items) (v=Volumes) (i=Images) [ for each column count Â“text Â” BibID (VID) numbers YTD ] b: b: v: v: i: i: Images (b=Items) (v=Volumes) (i=Images) [ for each column count image BibID (VID) numbers YTD ] b: b: v: v: i: i: Newspaper (b=Items) (v=Volumes) (i=Images) [ for each column count newspaper BibID (VID) numbers YTD ] b: b: v: v: i: i: Serials (b=Items) (v=Volumes) (i=Images) [ for each column count seri als BibID (VID) numbers YTD ] b: b: v: v: i: i: Videos (b=Items) (v=Volumes) (i=Images) [ for each column count video BibID (VID) numbers YTD ] b: b: v: v: i: i: FDA ARCHIVING IR ALL Bibliographic Items Archived: [ for each column count BibIDs YTD ] Volumes Archived: [ for each column count VIDs YTD ] Images Archived: [ for each column count JPEGs/JPEG2000s YTD ] Text Archived: [ for each column count characters (may include mark-up) YTD ] Numbers in the following example may not add up. 2 | Page Development Continues Development continues on the application with changes likely to be seen to the database as well. New resource types, such as newspapers, will be added with their own unique properties. Additionally, audio and video has not yet been implemented. As with all large projects in the changing environment in which we operate, the evolution of this project continues. Main Form Screen Prints This is the main form which is seen when the application is launched. This screen initially s hows all the UF resources in the database. This form can also be used to search for single items from the list. Here we chose to search for all resources with the word 'Gainesville' in the title. Additionally, search results are limited to items in the MAP project (and all projects under MAP). A single resource can be located by searching for the bib id directly. 5 | Page Serial Screen Prints Here we searched for all UF resources with the word 'House' in the author field from the main screen. Next, we will drill down and view the details of this serial. The Summary panel displays some of the basic information about a single resource. This screen is readonly, and is used to give a quick view of data which might otherwise reside on seperate screens. The Source panel displays information about the original source document, including holding location and identifiers. The next tab is strongly related to the chosen resource type. Since this object is a serial, the Serial panel is shown. You can see an example of this panel for a monograph here From this screen a user can click on a single volume to get more details. 6 | Page We now selected a single volume from the list of volumes under this serial. This Serial Volume panel shows information about this volume. Status is reported at the volume level, since this is a serial. This current volume has not been scanned, so there is no reported status. You can view which CDs or DVDs the images for this single volume are on by viewing the Archive panel at the volume lev el. Back at the serial level, the Electronic Resource panel allows us to set the project code and the destination technology. Additionally, comments about this resource can be included here. 7 | Page The Archive panel shows which CD's or DVD's include the files from this resource. Since we are at the serial level, information would be reported for every volume under this serial. Project Hierarchy Screen Prints The Hierarchy view displays the project structure to be viewed in tree format. From here, you can view and edit current projects, as well as add new projects. The Browse view displays the collection of projects as a flat spreadsheet. You can also launch a search to see all items in a single project code from this screen. We can edit and view the information about a single collection from this form. 8 | Page We selected the 'MHC' collection and now can view all items in this project. Archive Media Screen Prints The Archives form lets us view information about each of the CDs and DVDs in the local archive. Here, all items in the archive are displayed. We have now searched for all archived CDs and DVDs in the JUV project that reside in the range between CD number 500 and 725. 9 | Page Selecting a single row from the Archives form display the information for a single resource on the selected CD.